Following his graduation in clarinet under M° Giuseppe Tassis, he studied harmony, counterpoint and fugue under M° Vittorio Fellegara. He performed with classical music groups, dance and jazz bands. After making important experiences with Franco Cerri and Giorgio Gaslini, he received the Milan RAI National Orchestra (Big band) prize for first clarinet and alto saxophone soloist. His first records named Baghet and Cinque piccole storie were recorded at the end of the 70ies and made him popular with both Italian and international jazz audience. In 1978 he became popular developing a music which combines jazz memories and other forms of music either art or folk music: first with his Trio (he received the prize from the Critica discografica italiana), then with Ottetto - From G to G (Soul Note), the 5 star American magazine "Downbeat"; Les hommes armée (Soul Note) and Fugace (Ecm) Top Jazz best group, voted best record and best musician in "Jazz Musica". The long fellowship with Gianni Coscia, the accordionist, has brought them to perform all around the world. At present three CDs have been successfully met by their audience and a fourth one is coming out by Ecm in autumn 2011. In 1998 he was committed by the French festival of Coutances, le Mans and La Villette-Paris to compose a suite inspired to A midsummer night's dream by William Shakespeare which was recorded by Enja in 2000. Many orchestras have invited him to perform his compositions: the Koln WDR Big Band with whom he has created the CD Dedalo (Enja) with the arrangements by Gianluigi Trovesi and Corrado Guarino, guest Markus Stockhausen; the Guimaraes International Orchestra; the Bergen Big Band; the Bruxelles Jazz Orchestra, guest Dave Douglas; the Bari Synphony Orchestra; the Czech Republic Big Band; the Luzern Music Academy Big Band and the Slovenia Big Band. The Switzerland simphony orchestra committed him a piece of music dedicated toThe magic mountain by Thomas Mann which was presented on a summer tour in Switzerland in 2011. He composed Profumo di Violetta (by Ecm, 2008), with the Mousiké Philarmonic, an imaginary journey inside the Italian opera from Monteverdi to 18th century. The trio consisted of Umberto Petrin, Fulvio Maras and Gianluigi Trovesi gave birth to Vaghissimo ritratto (by Ecm, 2004), with the music by Monteverdi, Orlando di Lasso, Luigi Tenco and Jacques Brel. He has recorded and performed with a large variety of both Italian and international musicians such as Paolo Fresu and Enrico Rava, Kenny Wheeler, Misha Mengelber, Conny Bauer, Anthony Braxton, Keith Tippett, Cecil Taylor, Misha Mengelberg, Clarinet Summit, Peter Kowald, Gunther Sommer, Zhivaro, Michel Portal, Louis Sclavis. He is the member of the Italian Instabile Orchestra, a national ensemble which entails the best musicians of the Italian avant-garde. He recorded live with his quintet for L'Espresso jazz series at La Casa del Jazz in Rome in 2007, guest Enrico Rava. Many of his performances have been marked by a "baroque atmosphere". He has recorded All'improvviso with the ensemble L'Arpeggiata by Christina Pluhar where jazz and traditional music combine with baroque impro spirit. The ensemble toured all over the world. In 2011 Trovesi performed with the ensemble La Venexiana at the Halle Handel meets jazz festival. In 2010 he performed with Attilio Cremonesi and the Wien Orchestra Strings with Stefano Montanari, violinist and conductor. In 2003 he peformed again with the Trionfale Quartet: Manfred Schoof, Barre Phillips, Gunter Sommer with whom he experienced free improvisation. He has composed themes with Gianni Coscia for films such as Mi piace lavorare: mobbing by Francesca Comencini and Liscio by Claudio Antonini. He took part into the works of Luigi Cinque and the Swiss film Pane per tutti theme by Christoph Baumann and Jacques Siron. He has composed for the theatre with Gianni Coscia where he has staged In cerca di voce. He took part into Paolo Damiani's show I kiss your hands with Sonia Bergamasco, Fabrizio Gifuni, Danilo Rea and Rita Marcotulli. He has composed music for literature and poetry working with both Giuseppe Cederna and Stefano Benni. 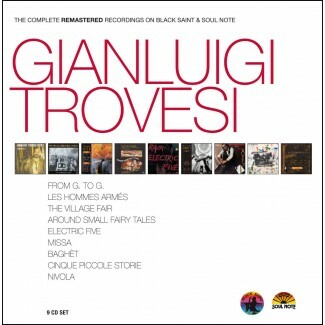 Trovesi has been performing with Paolo Damiani for over thirty years and he was chosen by him as a soloist in his Orchestre National de Jazz français edition. He has perfomed with Bruno Tommaso whose arrangements have enabled him to record - Around small fairy tales with the Enea Salmeggia Chamber Orchestra (4 and a half star in "Downbeat") and with Enrico Intra who has produced several programmes based on his compositions. The whole 2001 edition of the Barga Jazz festival was dedicated to him and his music.Mr. Luigi Sforza from Dams in Bologna and Mrs. Annette Maye from Hochschule für Musik Köln have written their graduate theses about him. He has also been the protagonist of the documentary film dedicated to him, called Il cortile della musica by Sergio Visinoni (Lab80 Film). For his art he has been appointed Ufficiale della Repubblica Italiana (Carlo Azeglio Ciampi, President of the Italian Republic), Chevalier de l'ordre des Arts et des Lettres (République Française) and Commendatore dell'ordine al merito della Repubblica Italiana (Giorgio Napolitano, Presidente della Repubblica Italiana).